Summer fruits drive me crazy. I want to buy them all but I also want to make sure I can eat them all. 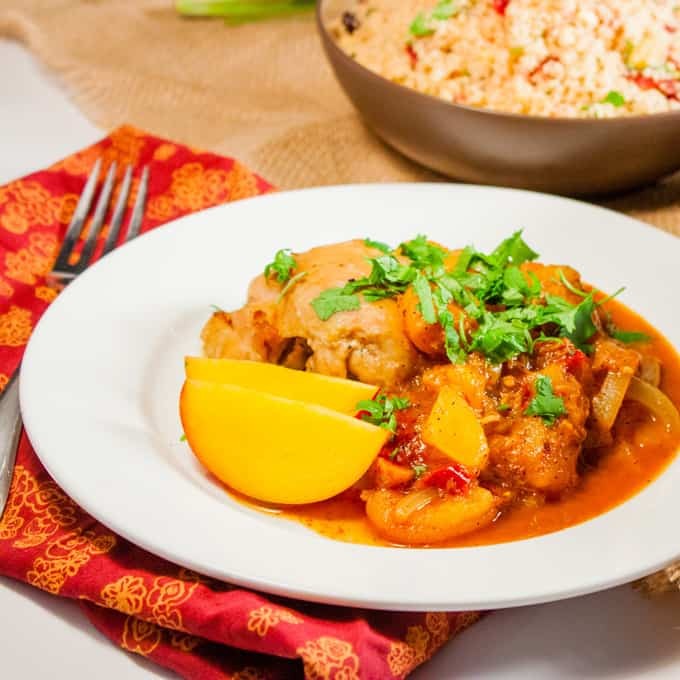 This recipe adapts my favorite Moroccan Chicken Tagine with Apricots and Chickpeas to take advantage of all the amazing stone fruits in season right now. The stewed fresh nectarines and plums give it a tart sweetness to balance the chili spice. The dried apricots absorb the complex sauce and bring it to a new level. We served this with a side of whole wheat couscous mixed with parsley, pine nuts, and dried cherries to continue the stone fruit theme. 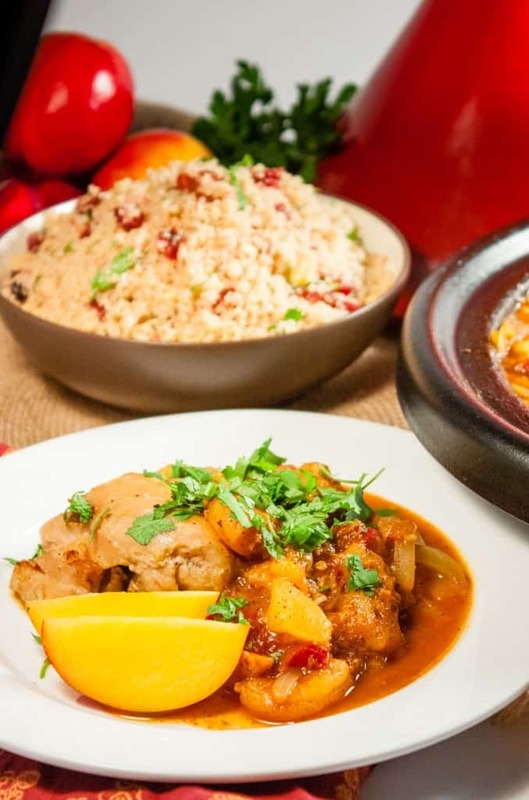 It would also be amazing with Moroccan spice marinated carrots or saffron rice on the side. This recipe is paleo, gluten-free, and delicious. What really makes this special, of course, are the spices: specifically saffron, Ras el Hanout and harissa. Saffron is easy enough to find. I use it frequently and buy it from Amazon but, for those who don’t use it as often, I’ve seen great prices on small amounts at Trader Joe’s. As far as harissa goes, my old standby is Le Cabenon . It packs a lot of heat and I love that it comes in a tube and can last forever in the fridge. In a small bowl, combine chicken stock, cinnamon stick, and saffron. set aside. 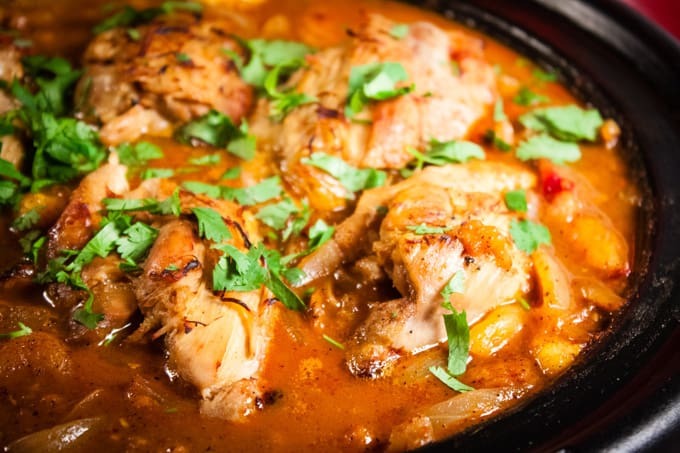 Heat 1 tsp oil in a tagine, dutch oven, or deep braiser over medium-high heat. Season chicken thighs with salt and pepper and cook until outsides are brown, about 6-8 minutes a side. Remove chicken to a plate. Add remaining 2 tsp oil to the pot and stir to scrape up any brown bits. Add sliced onions and saute, stirring, until translucent, about 6 minutes. Add minced garlic and saute another 30 seconds, until fragrant. Add Ras el Hanout and harissa. Cook another 30 seconds. Add tomato paste, 3 plums, 3 nectarines, apricots chicken stock, saffron, and cinnamon stick to the pot. Bring to a simmer and nestle the chicken thighs into the mixture, pour any juices that may have collected on the chicken plate into the pot. Cover and transfer to the oven until chicken is cooked through, about 20-25 minutes. 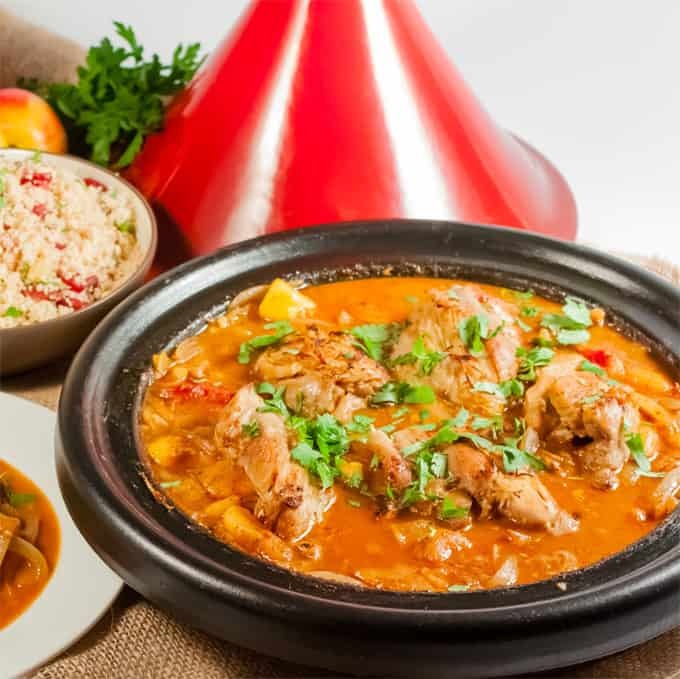 Alternatively, if you're using a tagine, you can reduce heat to medium low and leave on the stove top, covered, 20-25 minutes. When the chicken has reached an internal temperature of 165F, stir in the remaining plum, nectarine, parsley, and cilantro. 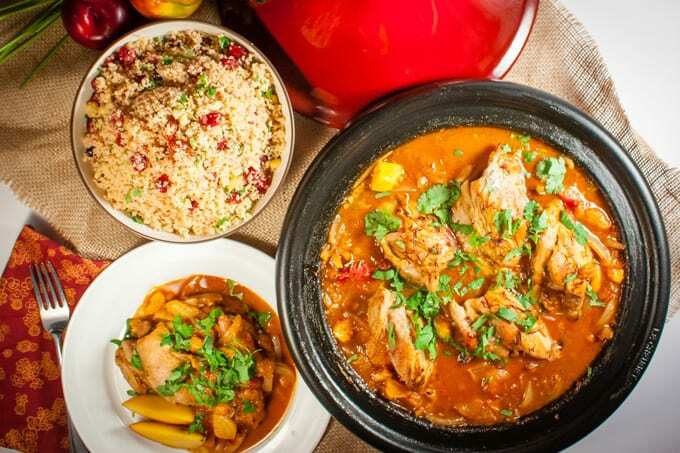 Serve with couscous or a side of Moroccan spiced carrots.